“Over 90% of the salt marshes in the San Francisco Estuary (SFE) have been damaged or destroyed and in general, the diversity of salt marsh vegetation in the SFE has decreased over the past 50 years. Some salt marsh plant species are now quite rare, and will require active revegetation to insure both their presence and their functions. 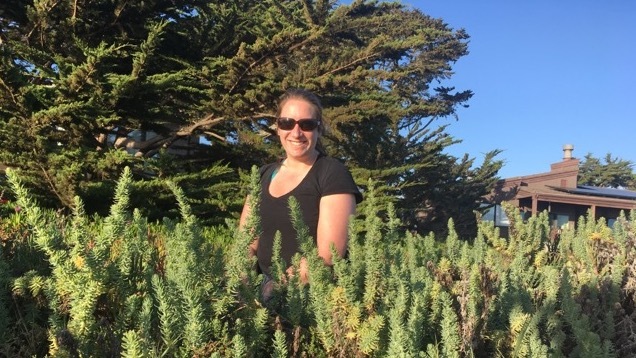 My thesis focuses on the endangered Suaeda californica, a salt-tolerant, succulent coastal wetland shrub that occurs in a narrow high tide zone along sandy salt marsh edges or estuarine beaches. The original native SFE population became completely extirpated around 1960. Plant material from Morro Bay was used to propagate and reintroduce juvenile S. californica to San Francisco Bay in 1999, and roughly 30 total plants have survived until now in three locations. As these low numbers hardly represent a restored population of S. californica, and the plants have not successfully self-recruited from seed, a reintroduction plan was developed.